YCP MPs resigned in the speaker format. 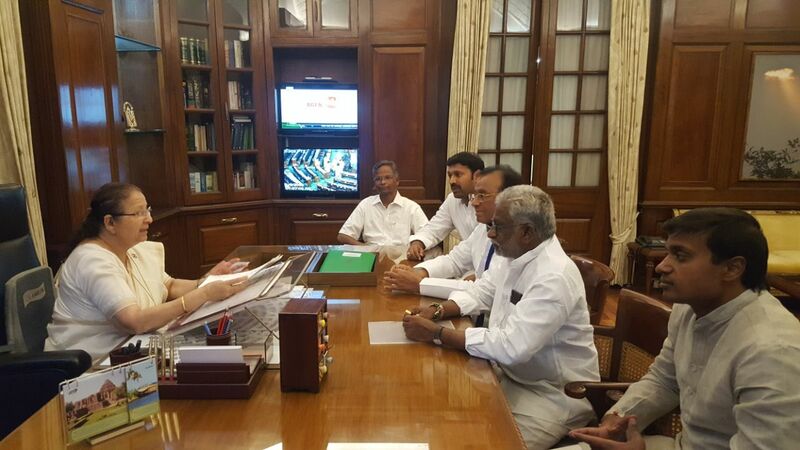 YCP MPs submitted their resignations to Lok Sabha Speaker Sumitra Mahajan on Friday. Speaking to the Speaker on the grounds that resignations are being submitted due to the failure of the Center in the implementation of division guarantees, including the special status of Andhra Pradesh. Speaker MPs were asked to reshape the resignations on this occasion. Earlier, the MPs filed a resignation letter prepared by the former Chief Minister Rajasekhara Reddy in the speaker format and paid homage to him. Later he moved to Parliament with resignations. Speaking on the occasion, the MPs said that they are important for state interests and are resigning for state rights. They then arrived at AP Bhavan. YCP MPs are ready to hunger strike for their special status. MPs YV Subbareddy, Varaprasad, Avinash Reddy, Mithun Reddy and Mekapati Rajamohan Reddy are among those who have resigned from their positions. YS Jagan Mohan Reddy commented on the resignation of YCP MPs. As stated earlier, our MPs submitted their resignations to the Speaker. On this Twitter account, he tweeted that Chandrababu was forced to resign from the TDP MPs by tweeting their Twitter account.